Nintendo just announced on its Treehouse live stream marathon that the long-awaited English version of the Super Smash Bros 3DS demo is coming out today for "select" Platinum members. Everyone else will get it next week. If Nintendo's deemed you worthy of early demo access, you should receive an email with four codes (sharing is caring, etc) today. Mere Ninten-mortals, meanwhile, will have to wait until September 19th to pretend to be cartoons and hit their friends. The demo has proven quite revealing for Japanese players, who received it earlier this week. The full game will launch in Japan tomorrow, and people have already managed to get their smash-attack-blistered fingers on early copies. We've already seen a lot of secret characters. If you want to remain pure and untainted—free to treat every unlock like a freshly snowed Christmas morn—probably steer clear of, um, a lot of the internet in the coming weeks. 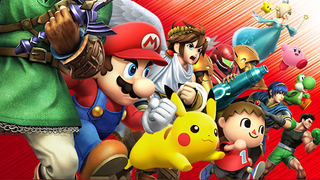 The 3DS version of Super Smash Bros is coming to US and EU on October 3rd. The Wii U version, meanwhile, is set for sometime this year. Maybe we'll find out more today? Finally? Please?